Had a great time with Frank and Kev in Lancaster. Stayed at Country Acres, in Gordonville. Left work early, picked up Frank, then Kev, and then to storage to pickup RoadAbode. Hitched up RoadToad - then headed to the turnpike. Scooted over route 100 to Route 30, and followed that to the campground. Ride up was easy, traffic relatively light, and setup easy, didn't even to need to level. Setup the basics, and then headed to Paridiso, as usual for a Friday night. Pizza was good as always. Enjoyed a nice fire and conversation, then readied for the next day. For a change - Kev tried the bunk. Think this may be his new spot from now on. on Sat, got up, put the jackknife sofa back in place and made coffee. we all hit the showers, and then headed out to the Bird-in-Hand buffet - but just had entrees. filling breakfast, and then went over to the farmers market located right next door. Only picked up some moon pies, but need to take the girls here sometime. Then just to check it out, we went to the Rhubarb Festival at Kitchen Kettle Village. Was fun to watch the band, kids making and racing "rhubarb derby" cars, and just check out the different wares available. We headed out toward the PA Railroad museum, but made a stop at a unfinished and outdoor furniture store - somewhere Kev wants to check out on another trip. We continued on but missed a turn for the museum - not a bad thing as we got to ride thru and see some farmland. Made a few turns, and ended up behind the musem on a gravel road. 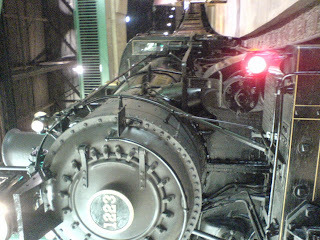 Once at the RailRoad Museum, we got to see the variety of equipment, learn about some history - talk to volunteer staff, and meet an auto of a book on teens that rode the rails in the 30's and 40's. He also presented a very well done documentary on the subject, done by his son and daughter-in-law (it's on PBS as part of the "American Experience" series) I picked up a copy - which he signed - for Granny, who use to do a little boxcar jumpin' in her day. 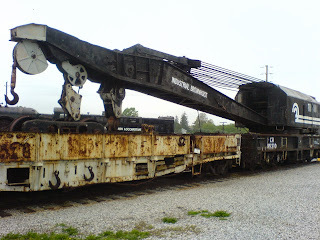 After the museum, we headed back to RoadAbode - check out some of our purchases, and then headed out first for a stop at the Mount Hope winery stand, and then for dinner at Stolzfus Farm Restaurant. One of my favorite Lancaster area eateries, we enjoyed farm made sausage, ham loaf, pepper hash, sweet and sour, and tons of other things. A real Lancaster style meal. Our bellies full, we headed back to the campground, picked up some firewood, and sat around the fire, enjoying some fruity after dinner wine and the warmth of the fire. Definitely a bit of chill to the air. Clouds started moving in, and I started to get some thunderstorm warnings from the web on my cell. We packed up and headed in just as the raindrops started to fall. Got out snack, and started to watch some of the "Bourne" series, and read a bit. Sunday, we made breakfast - egg, sausage and cheese on bagel or bread, and a freshly made fruit salad of bananas, strawberries, and grapes. We took ride to the city of Lancaster, past the prison (didn't know there was one) and into the center historical district. Had to pull over when I got a call from work for a few minutes. Partially resolved, I then turned back toward our camp. We packed up and got moving back on the road homeward bound by about 1pm. One odd thing - lost a fresh water hose - it formed a bubble and had a pinhole. Caught it before it did any damage - but do need to pick up a replacement. 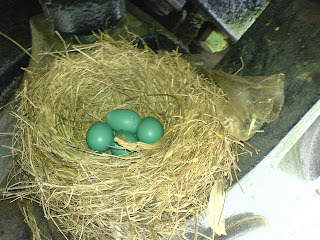 Bird eggs hidden on one of the trains - but we found them!